Winter is here. Mother Nature has been teasing us a bit with above-normal temperatures for this time of year. Those above-normal temperatures spoiled us and cause the 'normal' temperatures, which we have now, to seem extra cold. To join in on this meme, which is full of beauty, click on the badge. The tones in this is lovely! Gorgeous photo, Misty. It would look wonderful framed and hung on just the right wall. I agree with Kay. That photo would be beautiful in a nice frame and hung on the wall. Very cool that we saw (and appreciated) the same winter flowers! Yours are beautiful! straw daisies have a way of giving joy for a very long time. Oh wow, it's a joy to look at these. 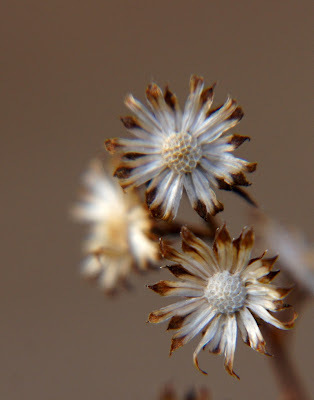 Even in winter there is a lot of beauty in those tiny flowers, we just have to take the time to look around us. Thanks for reminding us to do just that Misty.